Amazon Prime Review - Is It For You? I’m already partial to free shipping. If I can have something purchased online and shipped to a store, I will always take that option. I don’ know what it is about shipping charges that just make my skin crawl but I’d much rather pay $50 for something with free shipping than pay $45+$5 shipping fee. The biggest perk of Amazon Prime is free shipping on almost anything on their website. I was skeptical about this claim at first but after a year of using Amazon Prime to purchase over 40 items, I only paid shipping on three things. The best part about Amazon Prime’s free shipping is that shipping is 2-day so things get here quick. There is something to be said about buying everything in one place. Billing is easier, you get more familiar with how the process will go, where documents are located and how to file refunds. Plus you only have one place to look if you need to retrieve records for any reason. I have grown to love that if I need something, I go to Amazon and I can generate pretty little reports for all my past purchases no matter how far back I want to go. Come tax time, that will make things a breeze. Amazon Prime members have the ability to stream select movies free. I’ve browsed the movies a few times and found Amazon has a great selection of movies for free to Prime members but never once did I stream a movie. Until this feature is rolled out to other platforms than just the PC, it’s no reason to pay for Prime membership. While not an official feature of Prime membership, I found that will free shipping on almost anything, doing giveaways from my blog, shipping things to friends and even drop shipping things to clients was an awesome perk. I’d have to add their address to my account but then I could simply order whatever I wanted shipped to them, select their address and Amazon did the rest. 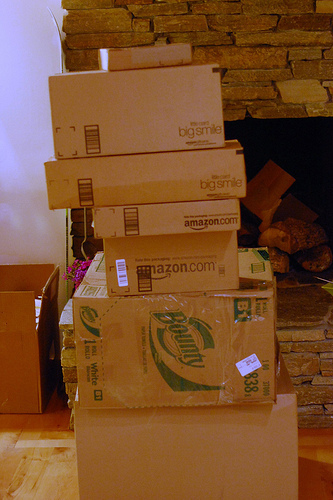 I purchased 40 items in one year from Amazon. If you figure an average $5 shipping cost, that would come to $200 a year in shipping alone. At that price, Amazon Prime is well worth the cost. Even at half that, $2.50 an item shipped, Amazon Prime still would have saved me $21 for the year. Plus everything is shipped 2-day versus 4-9 day which is great. Based on shipping costs alone, Amazon Prime is worth it if you purchase 25 things or more a year that have a shipping charge of over $3. My complimentary Amazon Prime membership is now over but I do plan to sign right back up and pay the fee. For the next four years, I can continue to use Amazon Prime under a grandfathered student plan for only $39 a year. After that period I will have to evaluate how many things I purchased from Amazon a year but if I were to bet, that number will only continue to grow and I will remain an Amazon Prime member for many years to come. Speaking on the business side of things, Amazon Prime is one of the smartest things Amazon ever did. If you look at Amazon’s history, they have done some brilliant things but having a tiered membership system like this is great for them. One of the biggest changes I noticed in my behavior since I became an Amazon Prime member was that I stopped looking elsewhere when shopping online. I do most of my research and make the majority of my online purchases through Amazon now. I do that because their site its easy to navigate and comfortable, but mostly because with free shipping, their prices beat most other places. Smart move, Amazon. From a consumer perspective – I love Amazon. From a publishing/vendor relationship – I hate Amazon. If they treated their partners half as well as they treated their customers, things would be perfect. Oh, and they replaced my Kindle free of charge 9 days after my warranty expired. I could have kissed the phone. I used to love Amazon, however their customer service in many areas has become really poor as I have experienced of late. I was not thrilled with Amazon Prime although at first it appeared to be a better deal than Netflix. It wasn’t. Prime is also only attainable with a credit card, debit cards NOT accepted. I used to purchase a great deal from amazon each year, always using the same debit card with NO problems. There are very few A list movies on Prime and just like Netflix, filled with B and C list shows which their own rating system shows up with as ones and twos. That alone should be a clue. I was highly disappointed after the first week of the free trial for many reasons. After using Prime and being so disappointed with customer service on several occasions, my spending through amazon is dropping considerably. From more than 40 purchases a year I’m now down to just a few. I’m an Amazon Prime guy. Books, clothes, and groceries. With certain things, it just makes sense. I love Amazon, and I spend way more money there than I should. but so far I haven’t bothered with Amazon Prime. I just make sure to order $25 worth or products and it qualifies for free shipping anyway. It might take an extra day or two using that option but my purchases aren’t really time sensitive anyway. If they were I’d definitely sign up. I typically don’t order anything over 25$ in a single order and often times I do need my things right away. With Prime and free SH on everything I buy (almost) sometimes I’ll place two orders within hours of each other because it doesn’t change the price and gives me time to make decisions if I need to. Because I take classes at the local community college, I have a “.edu” email address, with which I get free Amazon Prime for a year! After that, I think I can get it half off. Definitely worth it to try out Prime! Hey, I’d love to get a .edu address just to get the half off of prime. Makes it 100% more attractive. I’ve resisted it till now but the math doesn’t lie. Time to consider it again. Yea half off and a free year makes it hard to resist! I don’t buy enough online to justify it, but it seems to make sense especially the way that you broke it down here. My mother, the mad online shopper needs to check out yoru review. Thanks. Yea it’s not for everyone but if you do much shopping online, it can be well worth it! I’ve debated about getting Amazon Prime. But to be honest, I don’t use Amazon enough to offset the cost. Now with my kindle, I just order the digital versions of books versus the paperback versions. Love Amazon Prime with a burning passion. Just a note to others that may be interested, my father signed up for Amazon Prime but was able to make my account as well as my mothers a “prime” account. This means that for one fee we had three accounts with prime access. We use it all the time! Just be careful because it might increase your spending habits! Tell me about it! I’ve spent a lot more money on amazon purchases in the past few months since I subscribed to prime. Amazon Prime Instant Video is a scam. They have ZERO free hit movies or TV shows. They claim 1000s of titles but when you search through them you only get previews, cast interviews, season recaps, etc. It is a classic bait and switch. They can list they have 1000s of titles because they are trailers and previews. Technically they are not lying but it seems immoral to me. Wish they had not suckered me into paying. If you just want free 2 days shipping go for it. Although they will be offering this free to everyone in the next few months anyway. You hit the nail on the head Green! :I’m glad I only did the one month free trial, though I discovered much of what you said in the first few days of joining. Bait and switch is the PERFECT term, for it too. Sorry to see you got roped in. I’ll say this, almost all negative reviews have been about the programming offered for instant streaming. While I admit, if you relying solely on Amazon for instant video, it does come up short (I still keep my netflix subscription) judging it solely on that is missing the point. There are so many other benefits, the article here ball parks shipping costs at $5.00, but fails to mention you’re not only getting free shipping, but free 2-day. To compare, you’d have to compare the costs of paying for expedited 2-day shipping without a prime membership, which needless to say would be substantially higher than $5.00. All in all, if your primary motivation is instant video, and that is your only concern, then don’t bother, keep Netflix and don’t waste your money. But if, like me, you’re an avid online shopper, and the two day, 0 cost shipping is something you will utilize, it’s well worth the investment, many times over. Hey Jackie thanks for the advice. This Amazon Prime is a great service and I got a great promo deal as well and would like to share: http://amzn.to/1bcnwwO – Great article also. I have subscribed to amazon prime and ordered five books through this service a total of $79.05. I ordered these books the 18th of June and was PROMISED 2-day shipping. I will not be getting my books till Monday and Wednesday which is not 2 day shipping. shelby fluhatry on Is Auto Assure a Scam?